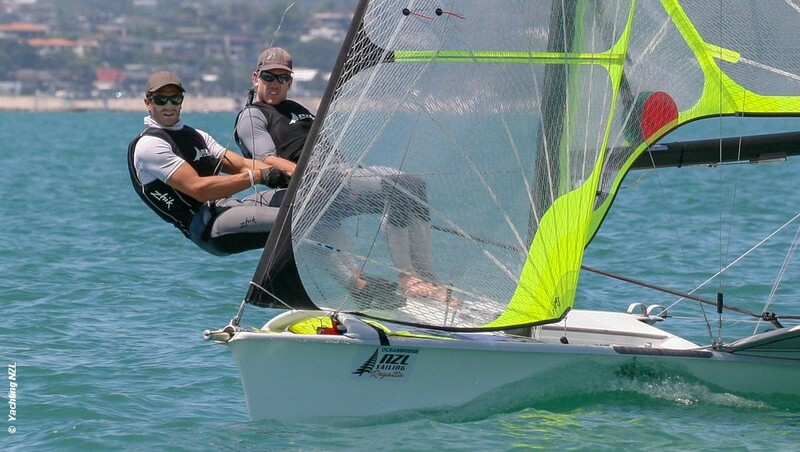 Pete Burling and Blair Tuke, who returned to Olympic 49er racing to win the Oceanbridge Regatta early this month, are struggling to repeat that dominant performance at the New Zealand Nationals. The Kiwi pair Logan Dunning-Beck and Oscar Gunn are tied for the lead with Will and Sam Phillips of Australia after eight races. Burling and Tuke are in third place, five points off the two leaders crews. Race wins have been spread through the fleet, and although Burling and Tuke have taken two wins they have been anything but consistant, including a UFD in race 2. In the women’s 49erFX Nationals, Alexandra Maloney and Molly Meech have dominated, winning five of the eight races. In second place are the Aussie pair Tess Lloyd and Jamie Ryan with Tanja Frank and Lorena Abicht of Austria in third.